← Sunday Salon: Are All Opinions Equal? A fighter pilot soon found he wanted to associate only with other fighter pilots. Who else could understand the nature of the little proposition (right stuff/death) they were all dealing with? And what other subject could compare with it? It was riveting! To talk about it in so many words was forbidden, of course. The very words death, danger, bravery, fear were not to be uttered except in the occasional specific instance or for ironic effect. Nevertheless, the subject could be adumbrated in code or by example. Hence the endless evenings of pilots huddled together talking about flying. On these long and drunken evenings (the bane of their family life) certain theorems would be propounded and demonstrated—and all by code and example. One theorem was: There are no accidents and no fatal flaws in the machines; there are only pilots with the wrong stuff. 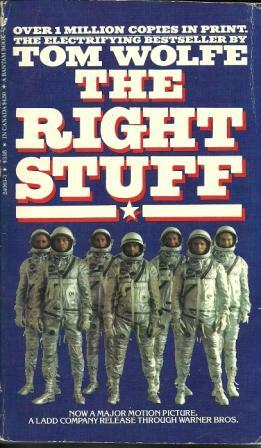 The right stuff—or as Wolfe more commonly calls it, “the righteous stuff”—is the bravery, the moxie, the nerve that enables a man (and as described by Wolfe, this is very much a testosterone-fueled manly ideal) to get into an experimental aircraft again and again and push that craft beyond what anyone has done before. It enables a man to keep climbing higher up the great ziggaraut to “join that special few at the very top, that elite who had the capacity to bring tears to men’s eyes, the very Brotherhood of the Right Stuff itself.” Those who have that righteous stuff keep climbing, and they don’t get left behind for any reason, not even for something as out of their control as fallen arches. If you’re left behind, you simply don’t have the stuff. I’ve seen the film version of this book several times, so a lot of the information here wasn’t new to me. Several scenes from the movie were taken right out of Wolfe’s account. 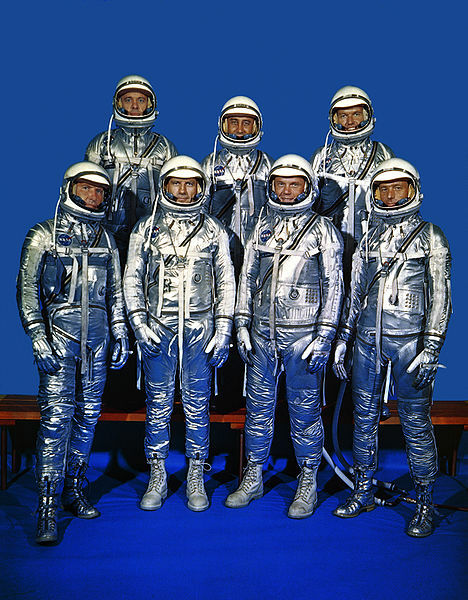 I was interested to learn more about the work of other test pilots, some of whom were piloting rocket engines that went nearly as fast and flew nearly as high as the spacecrafts NASA was developing. Some would even have said that what those pilots were doing was even more daring, and required a lot more skill, than what the astronauts were doing. These people [these administering the tests] not only did not treat them as righteous pilots, they did not treat them as pilots of any sort. They never even alluded to the fact that they were pilots. An irksome thought was beginning to intrude. In the competition for astronaut the kind of stuff you were made of as a pilot didn’t count for a goddamned thing. They were looking for a certain type of animal who registered bingo on the meter. However, once the men were selected, the media anointed them as what Wolfe calls single combat warriors, the U.S.’s representatives in the struggle for supremacy against the Soviets. And as such, these men were treated as the most righteous, the most worthy, and any evidence to the contrary was ignored, even if it came from the mouth of as great a pilot as Chuck Yeager, the man who broke the sound barrier and a prominent figure in this book. Wolfe depicts this tension between who the men were and who the media and government needed them to be without ever taking away from their extraordinary accomplishments. Wolfe’s account is not at all hagiographic, but it’s always respectful. One way in which Wolfe demonstrates his respect is by depicting each of these men and their wives as individuals. The men do, admittedly, get a lot more attention and emerge as more well-rounded figures than most of the women, but Wolfe at least attempts to tell each person’s story; and even among the men, some stand out more than others. John Glenn in particular has a strong personality that sometimes eclipses that of the others, but that seems to reflect the dynamic present at the time. The great thing, though, is that each of the men is given a moment, sometimes several moments, to take center stage. It’s quite a juggling act and Wolfe handles it well. I’m glad to have read this book and recommend it to anyone who’s even slightly interested in the space program, but I also think fans of narrative nonfiction and just plain good writing could get a lot of pleasure out of this. Hooray! This is, I think, one of the classics of literary journalism. The writing is spectacular! I think you’ll enjoy some of the stuff about military culture, and there’s some interesting commentary on the Soviet space program (and some references to We, which I think you recommended to me about 100 years ago). You’re making me want to read this book again. I remember absolutely loving it when I first read it years ago. The whole space race is utterly romantic (!) for me – I still get excited by the whole thing – I was 9 when we landed on the moon, so have always been a little fixated by it and that explains why I loved SF so much as a teen. This book is something else though, and brilliantly brings these early pioneers to life through the successes and the tragedies of this exciting era. I just missed the Apollo program. I was born at about the time it was drawing to a close, but my parents actually took pictures of the TV on the night of the moon landing, which cracks me up. I do remember getting up early to watch some of the first launches of the Space Shuttle, and I’ve been to the Kennedy Space Center a couple of times. It’s hard not to catch a bit of the excitement when you’re there. The stories that came out of those early years are amazing. This is just my second Wolfe (the other was I Am Charlotte Simmons), and this is definitely my favorite of the two. This certainly seems like a must-read for you then, since you’re an avid reader with a degree in astrophysics.